Among the many reasons Democrats are giving for why so many lost faith in them at the polls on Tuesday, some are blaming the party for losing faith itself - for neglecting religious outreach and messaging in the run up to Election Day. "It's been a real challenge organizing at the level of what was done in the last couple of cycles in faith constituencies because of a smaller staff and a small overall commitment," from the Democratic Party, said Burns Strider, who was hired by the party to help with faith outreach this year. Strider, who helped spearhead Democratic faith outreach in 2006 and 2008 - when he directed that work for Hillary Clinton's presidential campaign - said the party put substantially fewer resources and effort into faith-based strategy work this year than in any election since 2004. Eric Sapp, who runs a faith-focused consulting firm with Strider, said he wasn't hired by the House and Senate Democratic campaign committees or by candidates for Congress or governor, for the first time since he started doing such work. 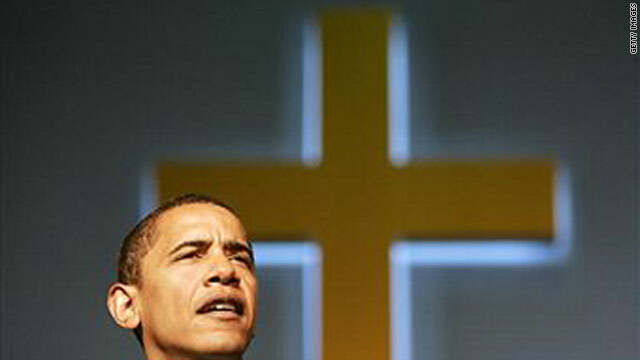 Others in the progressive faith worlds, meanwhile, say Democrats - including President Barack Obama - have shied away from the faith-based messaging that they honed in the years after the 2004 election, which was seen to be determined by so-called values voters. "A strong values narrative attracted many in 2008, including many religious voters who had long eluded the Democrats," the Rev. Jim Wallis, a progressive evangelical who advises the Obama White House, wrote in an election analysis memo on Wednesday. "There's now a larger problem with the lack of a big picture .... and a fundamental morals and values narrative that undergirds policy goals," Wallis said in an interview Wednesday. Democrats lost support across most demographics on Tuesday, and exit polls showed the fall-off among certain religious constituencies was dramatic. Among Catholics, Democrats saw an 11-point drop in support compared with 2006 and 2008, when the party took 55 percent of those voters. This year, the Republicans won 54 percent of those voters, according to an analysis by the Pew Forum on Religion and Public Life. Among white evangelicals, Democrats won just 20-percent of the vote, less even than in 2004, when that group flocked to the polls to support George W. Bush, an evangelical who took religious outreach to new levels. On Tuesday, the Democrats' share of the white evangelical vote slid by nearly 30 percent from 2008. "The economy is at the root of the Democrats' problem, but it doesn't mean that religion and other demographic factors cease to matter," said John Green, a scholar at the University of Akron who specializes in faith and politics. "Religion is a lens through which people interpret economic issues and it's a way that people can be mobilized," he said. The Democrats began stepping up faith outreach after the 2004 election, when the party suffered major losses and exit polls showed that many voters believed the Democrats were secular or hostile to religion. House Democrats starting a Faith Working Group, Democratic activists launched new organizations like Catholics in Alliance for the Common Good while others - such as Sapp and Strider - started new faith-based consulting shops. Through contracts with the Democratic Congressional Campaign Committee and the Democratic Senatorial Campaign Committee, those consultants arranged meetings between Democratic candidates and office holders with influential religious leaders in different parts of the county. The Democratic National Committee, meanwhile, built a stable of faith outreach staffers and consultants with specific portfolios, like Catholic and Jewish outreach. The work is credited with helping Democrats improve their performance among religious voters in 2006 and 2008, contributing to Senate and gubernatorial gains in Ohio, Michigan and Pennsylvania, and helping Obama take those states and others two years ago. This year, Sapp and Strider said there were no contracts between faith-based consultants and the Democrats' congressional campaign committees. They said that the DNC staff was roughly half the size it has been during the 2008 cycle. The DNC had Sapp and Strider start most of their work in August, they said, when it was too late to form serious relationships between Democratic candidates and officials and faith leaders. On Wednesday, Democratic National Committee Communications Director Brad Woodhouse defended his party's faith outreach effort. "We are proud of the robust and diverse faith outreach program employed by the Democratic Party that begins with volunteer faith captains in precincts all across the country and ends with a Chairman who spent a year as a missionary and has made faith outreach among our highest priorities as a Party," he said, referring to DNC chairman Tim Kaine. "To suggest that any one component of our election plan could have had a material effect in changing the outcome of Tuesday elections represents a fundamentally flawed analysis of what occurred," he said. Strategists said one challenge to Democratic faith outreach is that many of the activists who pioneered that work in recent years have been absorbed into the Obama administration. Joshua DuBois, Obama's faith outreach director from the 2008 campaign, is executive director of the White House Office of Faith-Based and Neighborhood Partnerships. Mara Vanderslice, who started the first major Democratic faith consulting shop with Sapp after the 2004 election, has also joined the administration, along with other progressive religious activists. "The best champions of this work went into the administration and they couldn't do political work any more," Sapp said. "There was this vacuum created."